There were several areas where the war really affected the people in the USA. Most dealt with the economy. The huge expansion in industry and the influx of women and minorities into the work force changed the USA. Industry Boomed: Prior to WWI, American industry was just becoming a force in the world economy. With the war, industry and the need for all the material to fight a war (ships planes, uniforms, guns, ammunition, etc) became a driving force in the economy of the USA and the world. This led to a huge expansion in American industry which continued after the war ended. 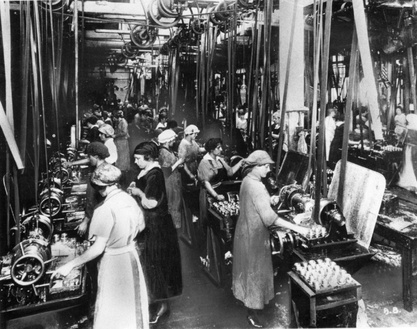 Women Enter the Workplace: During WWI women entered into manufacturing jobs in large numbers to replace the men going off to fight. Women worked as nurses, but also as factory workers, warbond sellers, working in the shipyards and as spies. They drove trolleys. They did many of the jobs normally done by men. Many of the jobs they did were dangerous. There were explosions at the munitions factories. This showed Americans that women could do the same jobs as men, and were willing to take the same risks. While after the war most women left the workforce, a significant number remained. This led to women receiving the right to vote via the 19th Amendment ratified in 1919 a year after the war ended. Minorities entered the workplace in large numbers. Many of them kept their jobs in the new factories after the war. The increased economic power that they possessed due to the jobs and income made them a force in the new post war economy.